Sante favors fishing for smallmouth bass, which are found in abundance in both rivers and lakes in his home state of Maine. He and his wife and cats spend all the time they can enjoying the outdoor life (including fishing) at their camp in the White Mountains of Maine. As you can undoubtedly tell from his e-mail address, Sante has a passion for bamboo. "....It made me feel like a real artist!" The Mt. 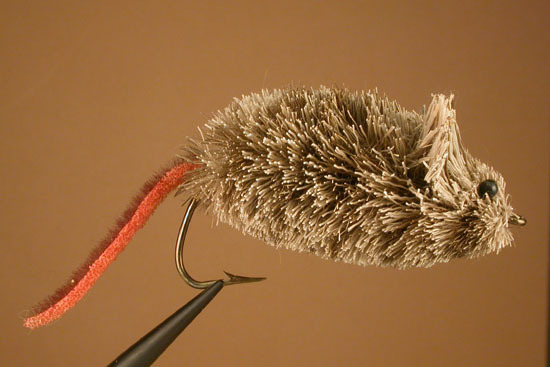 Agementicus Mouse is something that came about because I was pawing through a bunch of old fly-fishing and fly-tying magazines when I spotted a mouse pattern. After the sales pitch, the article went on to mention its effectiveness catching bass, pike, and other fish. I figured I could make one that was as good as the one in the magazine. My first eight or nine were nice and I gave them away. But I wasn't completely happy with them, since the hooks I had were not quite what I wanted. I finally saw some hooks that I thought had the right combination of features, including a thin and flexible wire hook, long shank (0 or 00), and a large gap with a slight offset. But because they were rather expensive, I only bought 24. The first three off the vise were good, but they got better and better as I developed a style of doing them. The name came to me in April of 1991, when our local fish and game club (York Fish & Game Association) co-sponsored an Earth Day Celebration atop Mt. Agementicus. It was a two-day event in which we planted 1500 seedlings and removed a little over four tons of trash and recyclable stuff from the woods. As part of the celebration I did some fly-tying at our booth and began tying a mouse. The ladies from the Art Association booth were full of questions as I tied, but I just responded, "You'll see ladies, you'll see." When it was completed the ladies were in awe over the life-like mouse in my hand. They asked if they could get one from me so I obliged and handed it over, as well as two others in various stages of being built and a piece of deer hide with hair still affixed. They placed it on display for the year and have kept Aggie. It made me feel like a real artist! Hook: Size 3/0 Daiichi 2720 light wire, large gap "stinger" hook. Tail: Strip of reddish-brown Wonder Foam. Separate the upper and lower layers to create two tails. Ears: One or two coats of head cement applied with a bodkin in front and back of uncut deer hair, using the bodkin to define the shape. Trim as shown in the photo above, after the cement is dry. Eyes: Black bar bells can be bought in craft shops. 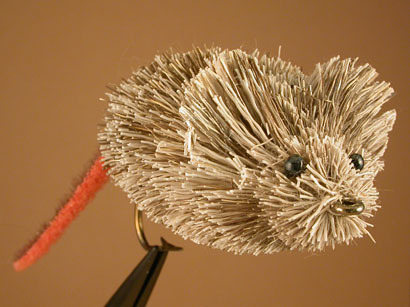 Or, you can make your own eyes with 20# or 30# monofilament line burned at one end. Create an eye socket with scissors and drop a bit of head cement in the center, before inserting the eye with hook nosed tweezers? Note: Use scissors to shape the body.